Infuse your home with a fresh touch of springtime. It's easy with our 100% woven cotton home accent scarf embellished in India with appliquéd fabric and felt pieces, embroidery, and dori stitching. 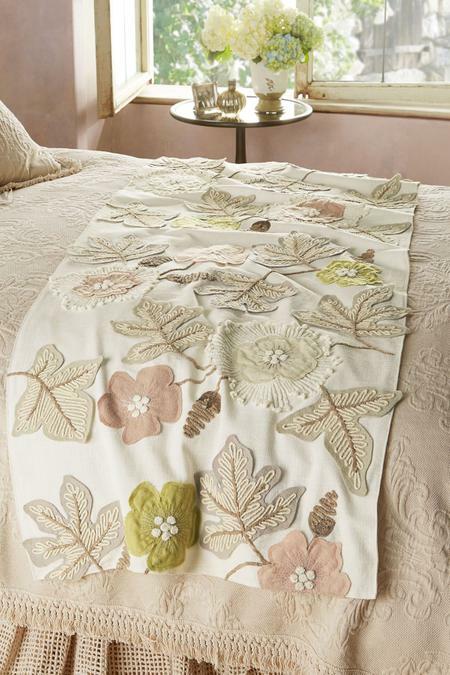 Subtle shades of pinks and greens give a light spring feeling, while the carefree leaf and blossom motif can't help but sweep winter from your mind. Drape it over your bed as a great layering piece to add color and texture; or use it as a table runner, across a console, or lay it over a favorite chair. Due to the intricate workmanship and embroidery techniques, each scarf takes many hours to complete.